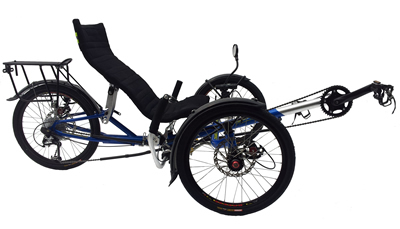 Trident Trikes is pleased to introduce the all new Chameleon Convertitrike!! The Frame: We shortened the center section a bit to give the frame less flex as well as added some vertical braces to stiffen it some more. The proprietary couplers have also been improved. Adjustable handlebars Front and Rear are now standard. There is also a Stoker’s Boom Support to keep the Stoker’s Boom from flexing during hard pedaling. Components: We are using the Microshift Marvo XE CNC Machined Rear derailleur and Bar End Shifters for this derailleur as well as the Stokers Crankset. Independent Pedaling is Standard. Chain Management: All of our new Chameleons have our new Idler System. This is a huge improvement over our original system. For all of us Recumbent enthusiasts, lets face it- we all wish we could have a bigger stable of bikes. A Single Trike, a Dual 650c Wheel Bike, a Comfort Bike and of course there is nobody who can honestly say they didn’t lust after a Tandem Tadpole Trike- especially one of the ones from that “G” company in Australia!! The problem was that you almost had to refinance your house or sell your firstborn child to be able to afford the $10,000+ it costs to get one of these, that will in all honesty probably not be your main ride. The Frame: In the end, there was really only one choice here- 4130 Chromoly Tubing. We tried frames in Aluminum and Stainless Steel, but felt that one could not compromise here without ending up with an inferior product. The Booms, Seats, and Handlebars however are Anodized Aluminum . This was an EXPENSIVE choice!! The booms in particular are sandblasted first to give it a little textured finish. This finish make the booms less likely to scratch than paint, give the boom tightening a little more “grip” and besides they look cool! There was the issue of couplers though. Obviously we could sell this Trike for a lot less money if it was an uncoupled Tandem only, but once we had decided to make the Single/Tandem Convertitrike it had to be coupled. The choice was to have the frame come apart into two pieces (using 2 couplers) or four pieces (using 4 couplers). The advantage of 2 couplers is of course the manufacturing cost and retail price is less. The advantage of 4 couplers is that it is much easier to transport and ship. There is one coupler company that dominates the market- I won’t mention their name, but you all know who they are. I about fell to the floor when I learned the wholesale/OEM price for these- there is a reason most companies charge $750+ for a Trike with just TWO couplers and over $1500 for 4-5 Couplers . Again, they make a fantastic product, but unaffordable in this instance. We have designed our own interlocking coupling system. We CAD designed these and they work amazingly well! Are they as lightweight as the “name brand” system? Nope… but on a 72LB Tandem Trike, we felt that the 1 LB penalty was easily justifiable. Single Trike and Tandem Trike in one package: There were so many issues here to solve! But our goal was to make the changeover easy and take only about 30 Minutes. You remove the middle section, the rear Brake Cable and long chain, recouple the front to the rear, recouple the derailleur cables, attach the front seat to the rear ,adjust the chain in some cases, and VOILA!! A Single Trike!! There is also an optional adjustment that can be made to the steering that takes an extra 5-10 minutes. Technically you should change the Ackerman Compensation when you do the changeover, and I have equipped the steering with positions for both the Tandem and Single. Basically you move the steering to the other holes and then adjust the wheel spacing. For the frame: once we developed the dual boom system many things fell into place. This also allow us to have one size frame that will fit almost everybody. The Captain can have an X Seam of up to 47 ½””, and the Stoker up to 43 ½”’. If you are a Captain taller than 6’5” , I can make you a custom boom that is a little longer. For all the cabling- much like the frame- the derailleur cables are all coupled and the center section is removed and the two ends put back together. Coupling the front brake cables is not necessary at all as they stay intact during the changeover. The exception to this is the rear brake. We felt that it was important to have a rear brake in the tandem configuration for safety. The rear brake is not used in the Single Configuration. Components: I LOVE all the name brand stuff ! So we decided you use them. We are using the SRAM Dual Drive System, Microshift Marvo XE Rear Derailleur, Microshift Front Derailleur, Bar End Shifters, and Avid BB7 Disc Brakes. Independent Pedaling (IPS) is STANDARD! Look at all other brands’ component mix and I challenge you to find a better mix than this!!. The stoker has control of the rear brake as well as the “front” derailleur (that is in the stoker position). Again- a big debate about this but it accomplishes a few things. When the Captain has control of this they cannot see this to make adjustment, it makes the changeover much easier as the center section stays intact, and lastly it gives the stoker something to do!! The seat has a built in pocket for your hydration bladder system, and has a reflective stripe on the back for safety. We include everything!! The rear rack, front and rear fenders, Captain’s mirror, a safety flag, rear light , 2 seat mounted water bottle cages, and 2 sets of alloy pedals are INCLUDED! This could easily add up to $300-$450 on other brands that make them “options” . Note: The Convertitrike is 81 Speeds as a Tandem, and 27 Speeds as a Single. Pricing The Trident Trikes Covertitrike retails for $6399.00 + shipping from Lincolnton NC. It is shipped in one carton. Shipping to any lower 48 US address is $135.00. Canadian shipping averages about $225.00. If you are in Canada, Hawaii, Alaska or any other country, please write or call for a quote. Please note however that unlike other brands, we fully assemble each Chameleon Convertitrike and make adjustments before disassembling them for shipping. The benefit to you is less reassembly and less adjustments will be needed . You are also certainly welcome to pick a FULLY ASSEMBLED new trike in Lincolnton, NC which is 30 miles from Charlotte, but be aware that I have to charge you 7% Sales Tax if you do so.